Sani-Cafe’ is uniquely formulated to ensure your expresso coffee machine produces the finest-tasting coffee. SKU: CMC. Categories: Cleaners, Specials of the Month. Tag: expresso machine cleaner. Replace regular coffee filters (with holes) of each brewing group with the “blind” filters(without holes). Add a halfteaspoon of Sani-Caf to dissolve. 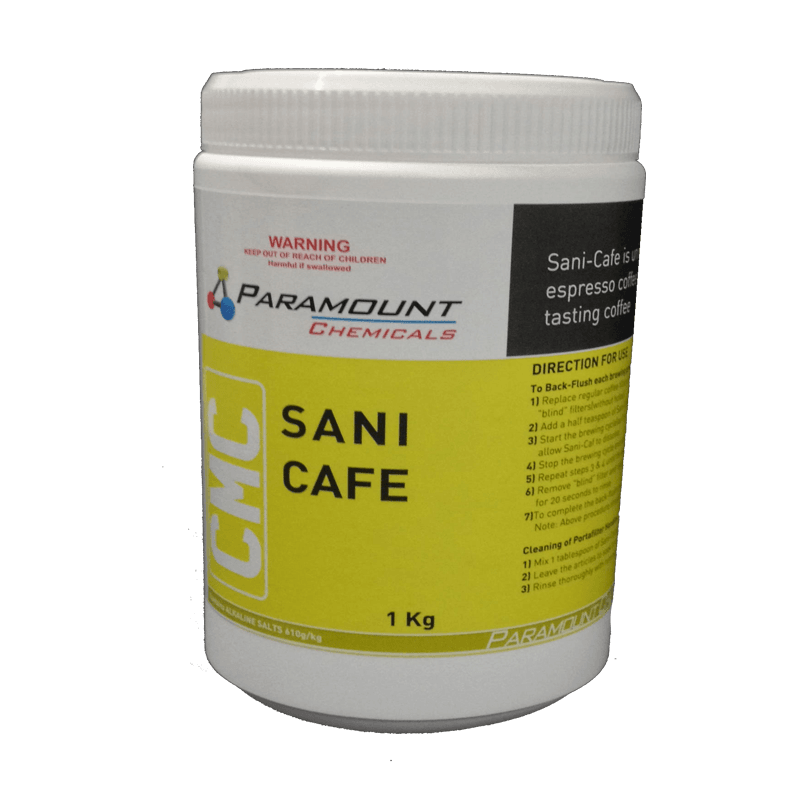 Start the brewing cycle(as if preparing coffee) and run for 20 seconds to allow Sani-Caf to dissolve. Stop the brewing cycle and wait for the 10 seconds. Repeat steps 3 & 4 untill the water is perfectly clean. Remove “blind” filter and replace with regular filter. Run brewing cycle for 20 seconds to rinse. To complete the back-flush procedure, brew and discard a single expresso. Note: Above procedure should be carried out at least once aweek for optimum results. Mix 1 tablespoon of Sani-Caf per litre of near – boiling water. Leave the articles to soak for atleast 30 minutes (or overnight). Rinse thouroughly with running water. If poisoning occurs contact a doctor or Poisons Information Centre. If swallowed, DO NOT induce vomiting. Give a glassofwater. If skin contact occurs, remove contaminated clothing and wash thorouhly. If in eyes, immediately rinse eyes thouroughly with running water for atleast 15 minutes. Read safety instructions before opening.